While researching this article on wilderness survival I came across, literally, hundreds of false beliefs and myths people tell themselves and others about surviving in the wild. I had to whittle them down to what I feel are the core ideas that most people believe. I feel that these top ten myths that people believe pose the greatest risk to people who are new to wilderness survival. Please leave your comments below, as I will update this article at a later date using your suggestions and topics. Where outdoor enthusiasts may have a leg-up on city-dwellers who are less likely to go hiking and camping, this does not make them survivalists. Hikers and campers generally have pre-planned hiking trails and campsites that offer c rude to luxurious amenities along the trail that are accessible to rescue and search parties. Essentially, walking a tightrope with a net. Survivalists are walking the tightrope without the net. If something breaks, bleeds or bewilders you, you need to have the knowledge and skills to bushcraft your way out of it. Wilderness survival takes practice. You should practice not using the amenities and specialized gear that many campers and hikers carry with them into the wilderness. Many have asked us what our favorite survival knives are, which is an easy question to answer. We have two brands that we recommend, one is a relatively inexpensive Schrade Survival Knives and the other is a higher end brand Esee Survival Knives. Both knife brands are excellent. We used to include Schrade survival knives in all of our bug out bags for years with no problems. For the money, they really can’t be beat. I personally own an Esee knife, and I wouldn’t trade it with for any other knife made, except another Esee. The point being, most people will buy a wilderness survival knife and throw it into a backpack and feel prepared for a survival situation. A survival knife is only a tool. Just like a hammer is a tool too. However, unless you swing a hammer regularly, there’s a pretty good chance you are going to smash your thumb and miss a lot of nails. Only with a wilderness survival knife, when you make a mistake, you may end up bleeding. Much as with knives, a lot of would-be survivalists buy survival tins, or small survival kits to put in their pack or truck. These tend to give people a false sense of security. First off, most survival tins and small kits are cheaply made and offer very little value. You are usually better off buying the items individually. 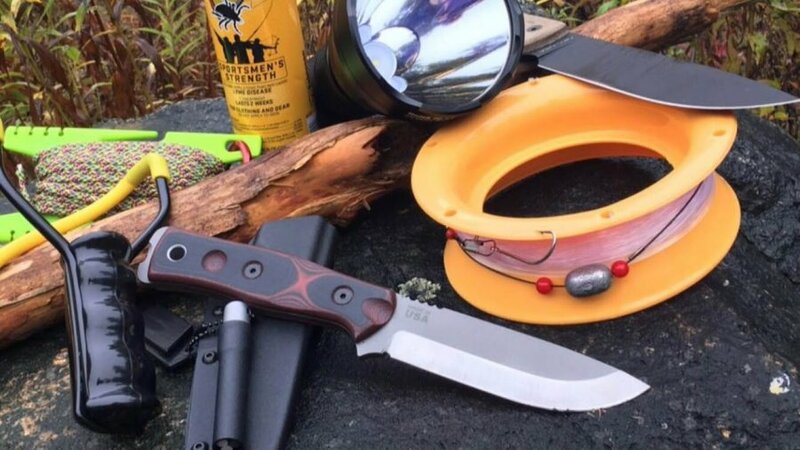 The good ones like the Esee Survival Tin are better suited for the bushcrafter more so than outright survival. In other words, survival tins and pocket survival kits are great to have around to help you craft and repair things that go awry, but not good at all for offering a safety net. In a wilderness survival situation you may encounter a still lake, pond or small stream. In our minds-eye, we feel that’s all we need to find a meal and to survive. Unfortunately, that’s not always true. In fact, there are a lot of dead ponds and small streams that have little or no fish in them at all. When in a survival situation, you have to choose your calories and time wisely. Meaning, if you waste all of your daylight and energy fishing a pond that doesn’t yield calories, you may be digging yourself into a hole. It’s very hard to come back from a calorie deficit in a wilderness survival situation. Fishing is one part gear, another part skill and another part luck. The unlucky survivor may not find water, or bait, or the fish may not be biting. A lucky survivor who has a hard time catching fish with a rod and reel and bait, is going to have an even harder time catching fish with just a hook and line. Most survival kit fishing kits are little more than fishing line and hooks. Using that type of set up is much more challenging than simply putting a worm on a hook and casting your line. If you have a fishing kit in your survival kit, and you should, take it out fishing one day. By the end of that day, you will have a very good idea of what you need to do to make it a better fishing kit. Personally, when we built bug out bags, we always included a trot line and floating bait in our bug out bags for this very reason. A trot line can be set and left alone while you tend to other wilderness survival activities. We highly suggest that you add some sort of bait that has a good shelf life to your survival kit fishing kit. In some weather conditions, starting a fire with a blow torch can be a challenge. Starting a fire in wet conditions is always a challenge. Most, if not all, wilderness survival fire starters are predicated on using a spark to light dry tinder. If you do not have a dry place or dry tinder, there’s a 99% chance a fire starter isn’t going to help you start a fire. Especially if you have never used one before. If you are a novice, here’s a quick fix: Go to Walmart and buy a 10 pack of Bic lighters and throw them in your survival kit and forget about them. Then buy some wetfire tinder. A lighter is ten times more useful than fire starters for people who have little or no experience using fire strikers. Then buy a magnesium fire starter and learn how to use it. Having the ability to start a fire doubles your chance for survival. Most people will say that water is the most important survival item, and in some ways it is. The key thing is to prioritize the most likely things to harm you for your area and pack accordingly. You can survive 30 minutes with hypothermia. You can survive 30 seconds with a pissed off mama bear. On a stormy night, without shelter, you are very likely to die from hypothermia, not dehydration. While fleeing a forest fire is unlikely, if you are surrounded by smoke, you will only last a few minutes. So when building a wilderness survival kit, do you prioritize it using an emergency shelter or a face mask? Bear attacks do happen, but they are about as common as forest fires. You need to prepare for the most likely circumstances, not the least likely, like bear attacks. When we used to work the gun show circuit, we used to hear this all the time: Well “I have a survival kit,” I’m prepared for “xyz emergency.” Sometimes, just for shits & giggles, I would ask ask them “what’s in your survival kit?” You’d be shocked at how few people really knew what items they had in their survival kit. Here’s a hint; If you don’t know what’s in your kit, you are not prepared for the rules of 3. It’s also a pretty good bet that those people were unable to operate the gear that was in their wilderness survival kits. The lesson being: don’t be fooled; a survival kit doesn’t mean you’re prepared. Dehydration begins to take place after 12 hours and starvation after a few days. Yes you may “live” a few days without water, and a few weeks without food but your strength and your ability to perform crucial survival activities will be greatly hampered. Without strength you will not be able to forage for food, start fires, build shelters and so on. The worst part of running out of food and water isn’t necessarily your body shutting down. It’s most often you losing the ability to survive and fend for yourself. Starvation and dehydration will likely get you killed way before your body shuts down. I would much rather know how to survive and have experience doing it than to find myself in the wilderness with a bag full of gear that I have no idea how to use. Practicing survival techniques and using the gear you have on a regular basis will keep you alive in a wilderness situation longer than chunking $200 down for a survival kit and throwing it in the garage. Make time to use and practice with each piece of gear that you buy. This is the number one rule of survival. #2 It’s a good idea to build your shelter near what? #3 What’s the LEAST important survival tool for a novice in a jungle scenario? The ability to shelter yourself from the elements, start a fire, clear brush, defend yourself, and provide clean drinking water are the most important tools. A compass is a very important tool, however if you are lost, the most recommended strategy is to shelter in place for those who will be looking for you. #4 Which symptom determines if you are experiencing SEVERE dehydration? Dry mouth and a rapid heartbeat is a sign for moderate dehydration. Vomiting and diarrhea is a strong indication for severe dehydration. #5 What internal temperature is required to break down bacteria cells in meat? Bacteria begins to break down at 160° Fahrenheit. #6 Why should you melt snow or ice before drinking it? #7 How long can a healthy human go without food as long as they have water? #8 Insect larvae contains a lot of protein. Where are the best places to find these insect eggs? #9 Which of the following can kill you the quickest? #10 Which of the following does NOT provide clues to help orient you toward true north? Wind speed. While not precise directional guides, moss on trees and ant hills can help you to figure out what direction you’re facing. In the Northern Hemisphere, moss on the south side of trees will be thicker and greener because that side often gets more sun; ants often build their nests on the south or southeastern side of trees, where it’s warmer. #12 An insect diet can actually save your life by providing you with which of these much-needed bodily sources of energy?